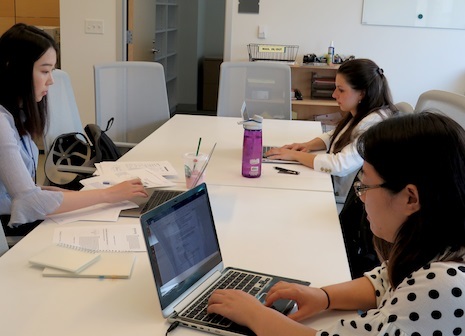 Collaborating in the Innovation Law Center in July 2018 are rising 3L Amanda Wang (clockwise from left) and rising 2Ls Kristian Stefanides and Christina Brule. Dineen Hall incorporates many natural light-filled spaces throughout its design, places where faculty and students can sit together and collaborate, and that is certainly true for the Innovation Law Center’s (ILC) suite in the southeast corner of the College of Law’s third floor. This is where a team of six students—supervised by adjunct professors—has been working diligently throughout the summer on IP, patent and market landscape projects for the law center’s numerous emerging technology clients. In fact, over the summer months the students—Senior Research Associates 3Ls Cody Andrushko, Parker Mincy, Amanda Wang and Xiaotong Wang, and Research Associates 2Ls Christina Brule and Kristian Stefanides—have been assisting more than 20 start-ups. Referred to the law center via relationships with GENIUS NY, NEXUS-NY, the CNY Biotech Accelerator and other statewide research centers and innovation economy partners, these clients are seeking help commercializing inventions that range from eye-tracking technology and weather drones to anti-microbial coatings and a carboxylate fermentation process. In addition to assisting these clients, the students also have presented on IP protection for computer applications to the Syracuse-based StartFast Venture Accelerator and have updated guidebooks on FDA regulations and computer apps for Empire State Development’s Division of Science, Technology, and Innovation (NYSTAR). On a hot Friday morning in July, Brule and Stefanides were joined by rising third-year law student Amanda Wang around one of the conference tables in the sunny Law Center suite. Working as a kind of study group, the students were in the midst of researching and writing reports for ILC clients with various technology commercialization challenges. One of Brule’s clients, for instance, is water remediation company RemWell. This company was referred to ILC via clean energy accelerator NEXUS-NY. RemWell’s new technology addresses drinking water contaminated with an emerging class of chemical contaminants, called per- and polyfluoroalkyl substances. “RemWell proposes groundwater remediation using a specialized reactor that can destroy harmful chemicals,” explains Brule, who is writing a patent landscape for the company, as well as a technical language section that has emerged from her own understanding of the technology. “The technical language section will help these highly specialized engineers explain their concept to other audiences using less technical terms,” notes Brule. All three students agree that this summer work experience is not just leveraging what they have learned in the classroom, it’s synthesizing their book knowledge—and even their undergraduate experiences and specialties—into highly marketable curricula vitae, for when it’s their turn to enter the job market.